Are We In a Treasury Bubble? If you read Brad DeLong, you probably notice that he is a bit in awe of Krugman’s ability to be right about everything. Actually, Krugman isn’t right about everything….But to give the devil his due, he is right about an awful lot of things. Why is that? ….Think about all his recent posts mocking the conservative fear that big deficits will lead to higher interest rates. What evidence does Krugman use? He cites the low and falling 10 year bond yields. In other posts he has used TIPS spreads to explain why inflation is the last thing we should be worried about. Now flash back to March 2009, when Krugman warned that $780 billion in stimulus would not be enough to get the job done. Did he know this from his models, as he claimed? Or did he cheat, did he peek at the equity, commodity and bond markets, and notice that all were predicting a severe recession with lots of disinflation, if not outright deflation? I think he peeked. thinks that interest rates and inflation are going to remain subdued, then your best bet — as Krugman and DeLong point out regularly — is that interest rates and inflation are going to remain subdued. Of course, neither Krugman nor DeLong is a big fan of EMH, so Sumner is having a bit of fun at their expense in this post. Still, there’s a point to the snark, and it’s why I’m a smidge less sure about the market’s view of interest rates and inflation than K&D are. The problem is that I’m on their side when it comes to EMH: it really isn’t a very reliable theory, and it’s especially unreliable in the middle of bubbles. Relying on market prices as a guarantee of safety during the credit bubble of the aughts would have led you wildly astray, and I suspect that it might be doing the same thing now: thanks to the global recession, the overall dearth of good investment opportunities, and a general fear of the future producing a sustained flight to safety, we may be in the middle of a treasury bubble that’s pushing interest rates to artificially low levels. 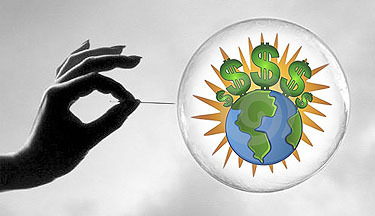 If we are, then that bubble may pop unexpectedly and we may learn that the market has been fooling us all along. Now, DeLong in particular has been tireless in making a related but separate point: it doesn’t really matter what you think about the future. If the market — whether or not it’s being fooled by a bubble mentality — is willing to loan the government money for 10 or 30 years at low interest rates, then the government should take the money. Once the rate is locked in, it means we’re getting cheap funding to stimulate the economy, and we might as well take advantage of it. This has nothing to do with either EMH or any attempt to predict the future. And I basically agree. I’m not sanguine about the state of the economy, and I think the risk that either expansionary fiscal policy or expansionary monetary policy will touch off a serious inflation storm is small. In any case, small enough that I’m willing to take it. Still, there is a chance that expansionary policy will, at some point, spook the market enough that it wakes up from its bubble and decides to send interest rates skyrocketing. I don’t think it’s a very big chance, but it’s a chance. And it’s why I’m just a little bit waffly on the whole subject.